From the back cover: "After discovering that her husband was a bigamist, and having a tornado destroy her Amish country inn, Magdalena Yoder thought it couldn't get much worse. But it has - her own sister has agreed to marry Magdalena's sworn enemy, the dim-witted police chief. 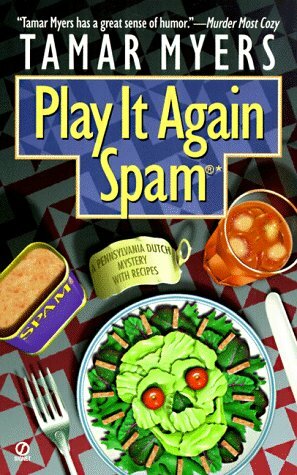 She's busy enough as it is - putting the PennDutch Inn back on its feet, catering to a group of visiting veterans...and finding new ways to use Spam in the inn's simple country cuisine. But now one of her guests is missing - and with the police chief stuck on cloud nine with her sister, it's up to Magdalena to solve the mystery in time for a piece of wedding cake!" One of my favourite sleuths. I laughed out loud many times. Gave to my sister to read. Enjoy! My sister gave me this book to read. Gave to a friend to read.